The South-Central Synod of Wisconsin-ELCA Youth & Family Ministry Network maintains a strong online community via our Facebook group (https://www.facebook.com/groups/scswyouth/). Lay leaders, volunteers, pastors, and church staff engage with one another via posts and in-person conference networking. There is idea sharing, problem-solving and general conversation. The network provides support to one another in cooperation with the national ELCA Youth Ministry Network and the Region V Network facilitator allowing our synod to connect to other youth and family ministry leaders from across the country. The ELCA Youth Leadership Summit is an annual gathering for high school youth identified as leaders and adult representatives from each synod from across The ELCA. Two youth in grades 9-12 and one adult per synod are invited to attend. This year Rev. Steve Kottke, Assistant to the Bishop for the South-Central Synod of Wisconsin will accompany our youth to the summit. This summit focuses on leadership development through engaging speakers and thought leaders in key areas at the intersection of leadership and faith in daily life AND faith formation and building connections for high school youth in the Evangelical Lutheran Church in America. Youth are challenged to take home what they have learned to inspire action in their own synods and youth groups. The Youth Leadership Summit is a shared ministry between ELCA Youth Ministry and The SYMBOL Network (Synodical Youth Ministry Leaders). The theme for the 2018 Summit is “Through Christ We Can” and took place November 1-4 at Camp Carol Joy Holling in Nebraska using Philippians 2:1-5 as it’s scriptural base. The event focused on young people’s call to ministry for the sake of others and advocacy because of their faith. For our learning and networking times they were joined by various ELCA ministries and staff including Advocacy, Young Adult Ministries, Justice for Women and Global Mission. A hallmark of youth ministry in the ELCA and the South-Central Synod of Wisconisn is the ELCA Youth Gathering. Every three years, 30,000+ high school youth and their adult leaders from across the Evangelical Lutheran Church in America gather for a week of faith formation known as the ELCA Youth Gathering. Through days spent in interactive learning, worship, Bible study, service and fellowship, young people grow in faith and are challenged and inspired to live their faith in their daily lives. An important part of the Gathering’s ministry are the two pre-events, the Multicultural Youth Leadership Event (MYLE), a faith formation and leadership development event primarily for youth of color, and the tAble, a gathering that gathers, blesses and empowers youth with disabilities. Calling all those who work with children, youth, and family ministries! Are you a pastor, staff member, lay leader, or volunteer that works with faith formation? Join us as we learn, dream, and worship together February 11th-13th at Bethel Horizons in Dodgeville. 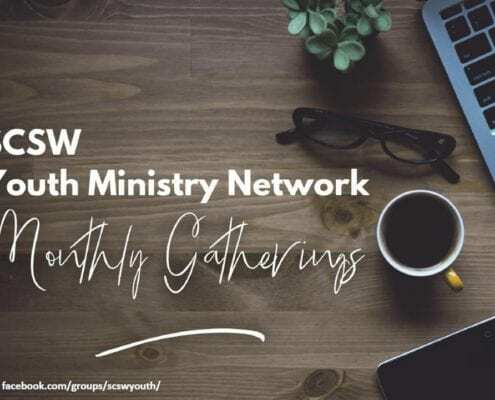 The Youth & Family Ministry Network of the SCSW Will Gather! https://scsw-elca.org/wp-content/uploads/2018/10/YFMNetwork.png 159 431 Robin Cherwinka https://scsw-elca.org/wp-content/uploads/2017/11/South-CentralSynodofWisconsinLogo.png Robin Cherwinka2018-10-24 10:36:072018-10-31 08:34:18The Youth & Family Ministry Network of the SCSW Will Gather!